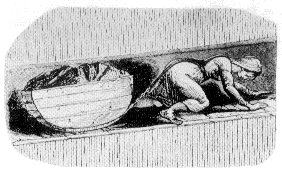 A child pulling a tub of coal in an underground mine, during the Victorian era. From http://www.victorianweb.org/history/ashley.html, a educational site offering free info on the victorian age. Petula Dvorak has just published an article in the Washington Post about a particular case of modern domestic slavery. I urge you to read it. The abuse was substantial but not sexual. It turned out better than in many other cases of human trafficking. But the victim is still cowering and hiding from the couple that exploited her, as if she were in a witness protection program. Justice has not been done. The abusers have not been punished, and they have not been prevented from victimizing other young women. The following actions would provide justice, and would protect others from the same abusers. 1 – The victim should be enabled to call home, and tell her adoptive family in Africa that she is safe, but in hiding. She should describe what the family “friend” and his wife did to her. She should urge her parents to warn others in their community, because the abusers were from that community, and are likely to fish there again. 2 – The Immigration and Naturalization Service (INS) should obtain a search warrant to retrieve the victim’s passport and visa. 3 – The victim’s Embassy should be alerted, so that the abusing husband and wife are never again allowed to enter the country where they recruit victims. 4 – The abusing couple should serve prison terms, and should also be required to pay their victim at least $100k.